My name is Dr. Mark Palmer and I’d like to take this opportunity to introduce myself and my family. My wife Jaelynne and I have been married for 10 years and are the parents of three boys: Kase (9) and Brady (6) and Maxen (3). 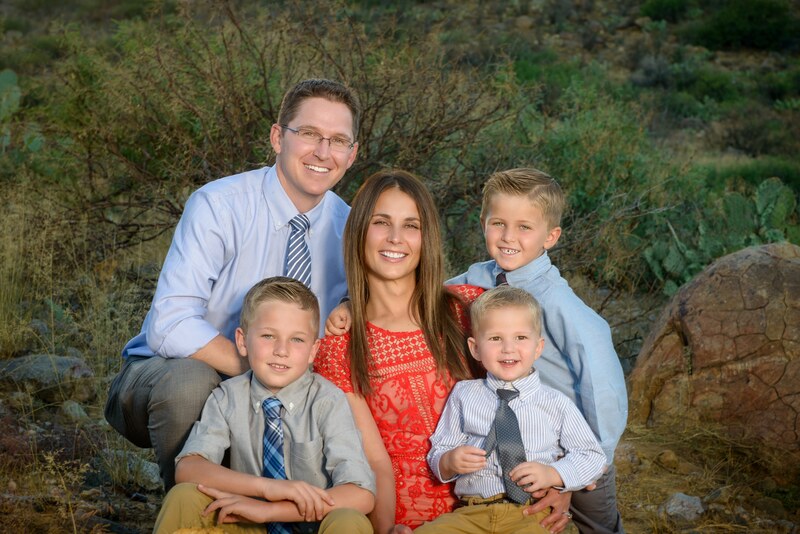 I was born and raised in the Gila Valley and I am thrilled to be back home among family and friends to practice dentistry and raise our family. I attended the University of Colorado (CU) School of Dental Medicine where I received a Doctor of Dental Surgery Degree (DDS). As part of my training I saw thousands of children patients across the state of Colorado and enjoy working with kids and adults! This advanced training has allowed me to gain valuable experience and develop my own techniques and skills to provide gentle and high quality dentistry. I was also fortunate enough to be selected by my mentors and faculty for several meaningful awards including: the Dr. Solomon Averbach Award for demonstrating extraordinary compassionate clinical care, the American Association of Oral and Maxillofacial Surgeons Dental Implant Award, the Hanau Award for Clinical Excellence in Prosthodontics, and the Horace Wells Award for outstanding achievement in dental Anesthesiology, among others. Having been trained with the latest and most proven research to date at a nationally renowned dental school, I feel extremely prepared and excited to take excellent care of my patients and friends. I have a strong commitment to continuing education in order to maintain my skills and understanding of this ever-advancing field. I also have the privilege of participating as a member of the Global Dental Relief Group, which provides dental work to kids in need across the globe. Being fluent in Spanish, I had the opportunity to join this group on their mission to Guatemala with nineteen other dentists and was able to see thousands of children who have never seen a dentist in their life! I enjoy working with kids and have been involved in multiple organizations pertaining to youth such as Operation Smile, Cherokee Indian Pediatric Clinic, and the Boy Scouts of America.